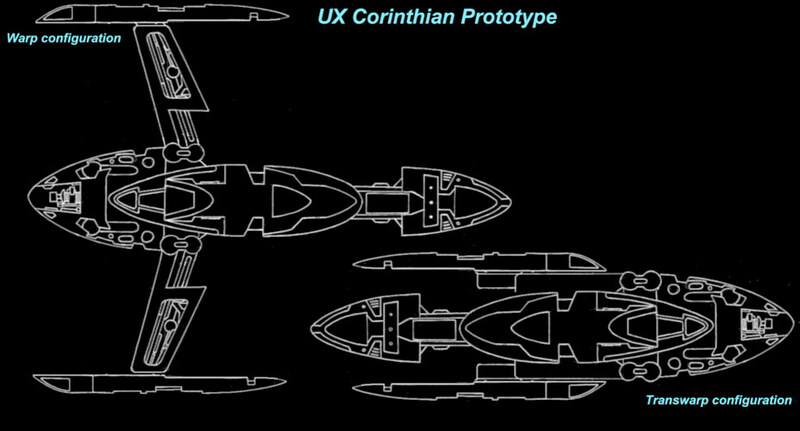 The Corinthian was an experimental prototype built at a covert Section 31 installation. The vessel was built with the sole intention of testing technology acquired from a number of alien species but principally based on a Borg scout. A small Borg vessel was captured after the conflict at Wolf 359 and reverse engineered so that the technology could be duplicated and adapted for Starfleet use even though most of it was still not yet properly understood. 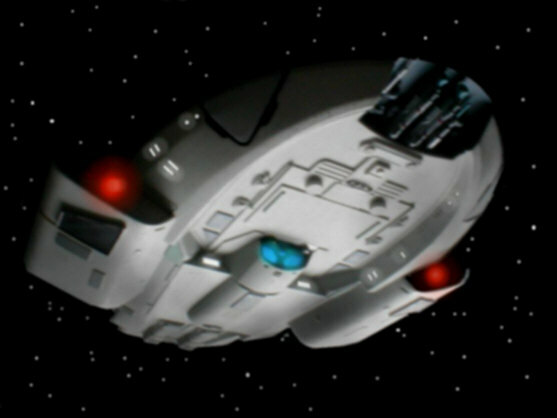 The ship completely failed to function and the project was shelved with the ship remaining incomplete until a Starfleet officer unwittingly initialised the craft by bonding his consciousness with the computer system. The ship is in a constant state of change as the systems adapt themselves for maximum efficiency and does so according to the pattern of the thoughts of the Captain making the vessel highly erratic and unpredictable. The ship is small, having minimal crew accommodation and no recreational facilities as it was never intended to serve in deep space for long periods of time. 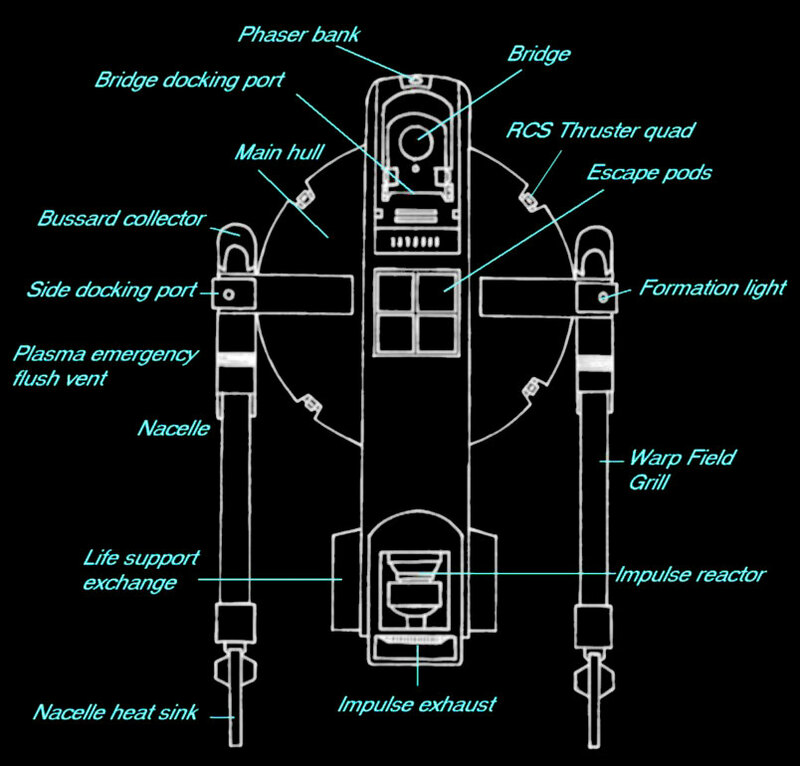 The bridge section is ejectable in the event that the ship is damaged beyond recovery and the vessel is equipped with an array of escape craft including a Type 6 shuttle stored in a bay towards the rear. 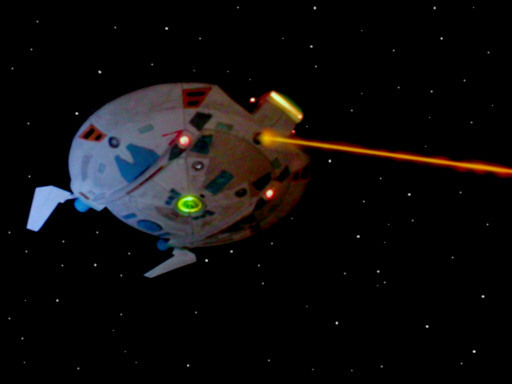 A large experimental phaser cannon is mounted in an alcove in the nose, attached to the main equipment testing palette. It is of a type normally mounted to stations or planetary bases and has never before been fitted to a ship due to the power consumption and the fact that it requires a permanent magnetic shield during the firing cycle to prevent it from over-heating. The most important innovation of this design is the warp drive. The new materials taken from the Borg have impressive resistance to torque and allow a new swept forward pylon design for normal high warp operation. 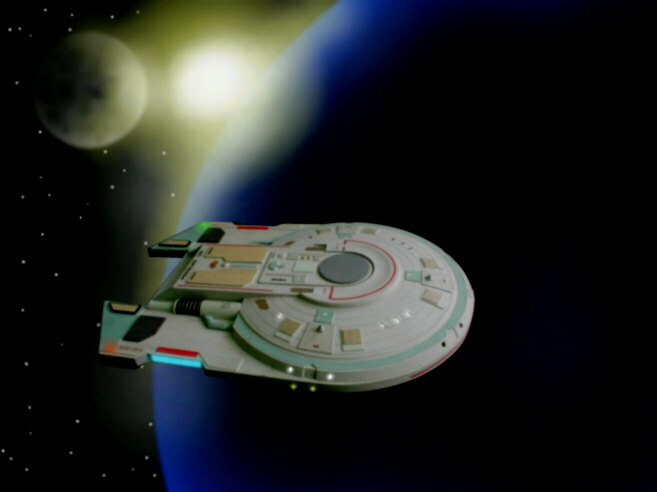 In addition to this the ship is fitted with a Transwarp drive that allows the ship to travel at speeds between 8 to 10 times faster then warp 9.9 for brief periods of time. 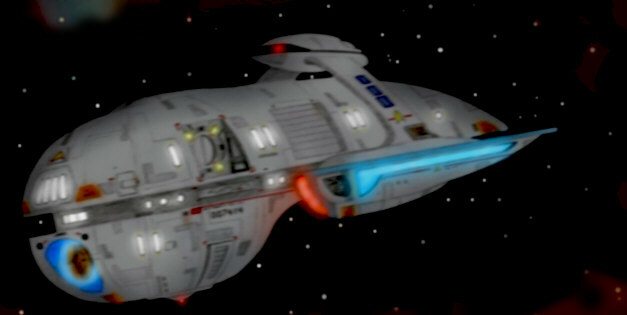 Because of the enormous stresses involved the nacelles are designed to swing back into alcoves beneath the bridge and the crew have experimented on adopting this configuration for tactical purposes. 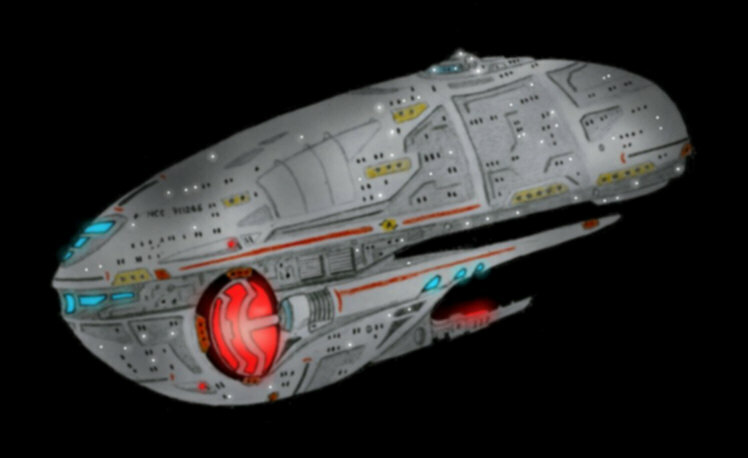 Most of the abilities of the ship are untested but it currently serves Starfleet Intelligence as a special operation ship to investigate Section 31 activities and for additional security only one Starfleet Intelligence Captain has any direct contact with the crew. 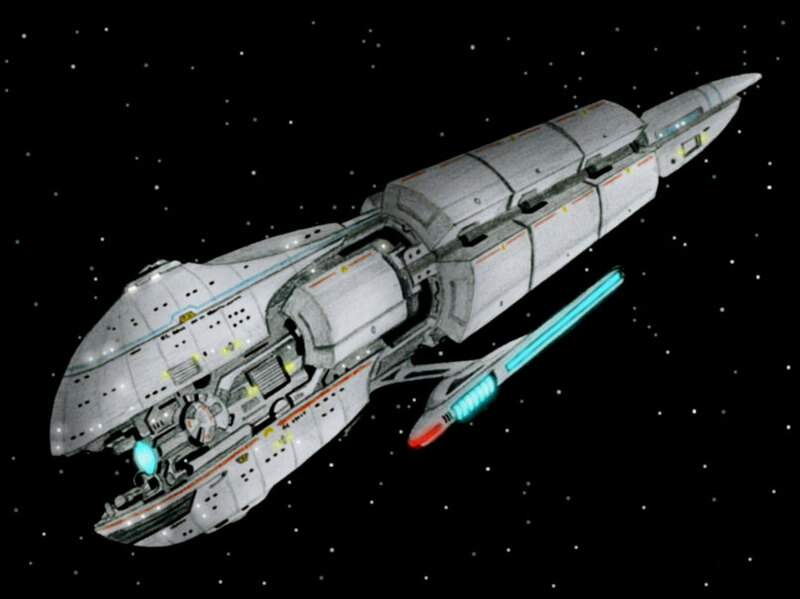 The Apex was an advanced Starfleet prototype utilising several new and highly advanced technologies. Built at a new and restricted facility in only two weeks the design is a radical new departure in starship engineering. The upper and lower hulls are identically shaped and the entire engineering deck separates the two. 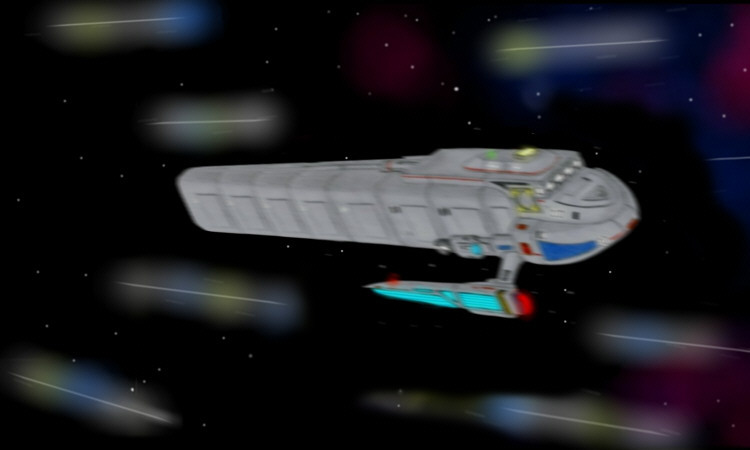 All of the vital ship’s functions are carried out by a single deck with a novel warp core running horizontally between the nacelles. The Bussard collectors are unusual domes but the placement has been shown to yield greater efficiency while travelling at warp. Around them is a ring of RCS thrusters that can manoeuvre the ship in virtually all directions requiring only additional RCS placements at the rear of the nacelles and breaking thrusters in the nose. This design frees up the hulls and maximises internal capacity. The lower hull is the storage and supply deck with the deuterium tanks and engineering spares as well as a small shuttle pod bay carrying two auxiliary vehicles outfitted for external maintenance as well as normal shuttle operations. The upper main deck is the tactical and crew stations and houses the entire ships complement. Twin impulse engines protrude from the main hulls for greater redundancy and to supply a secondary power source if the warp core is knocked offline. 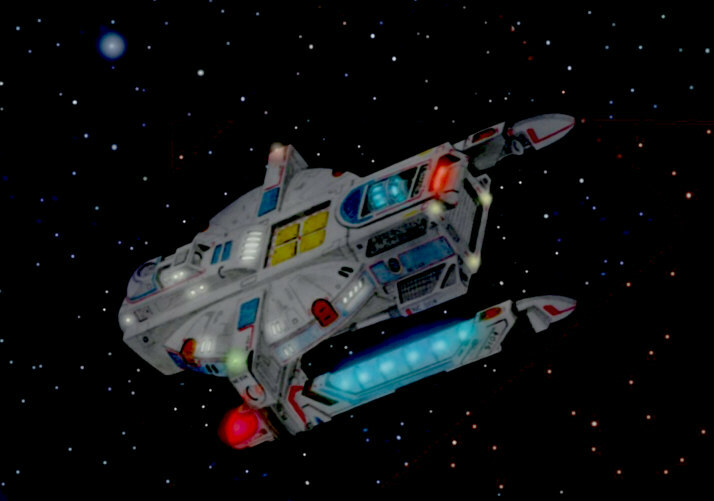 Because of the hull shape the ship only needs 6 phaser strips to cover all arcs of fire which also makes the targeting processors faster in acquiring a lock on an enemy vessel. The Apex was designed to usher in a new era in starship design. Small though she is the vessel has many novel design features that look set to become standard across all future Starfleet vessels. The Fury project was a Section 31 experiment into artificial sentience. It was discovered that a scientist had developed a tool which had demonstrated a level of intelligence unseen before in constructed beings beyond the work of Dr. Noonian Soong. Several of the “Exocomps” were acquired for study and their consciousness was recreated in a much larger computer that was designed to serve at the heart of a small Starship. The Fury project was conceived to be an autonomous vessel serving in packs of three to protect vulnerable larger vessels or installations. Section 31 had severe crew shortages due to the extensive requirements made upon each member to ensure absolute security. 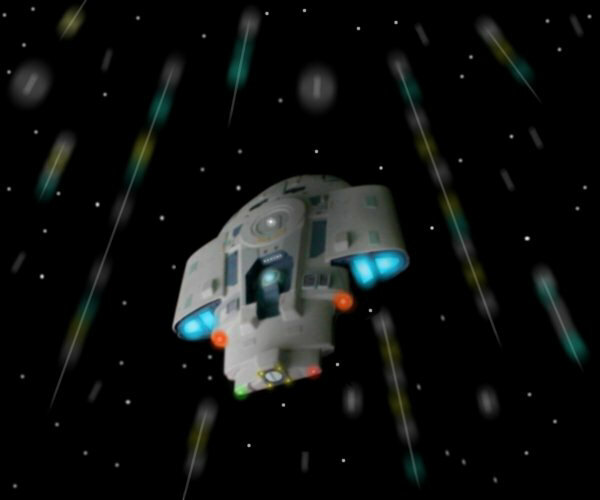 The computer of each ship was tied into the other two in the group via a scrambled subspace link so that each of the vessels, while separate could formulate an attack or defence together, this required the largest subspace antenna ever mounted on a Federation vessel. The ships were designed to accommodate a crew of two to watch over the actions of the system but it was hoped that it would be possible to quickly do away with any human crew once the ships proved to be reliable. They had a very sophisticated replicator system and a simple modular design, the hope was that they would be able to regenerate from any damage without a repair crew so long as the damage was not too severe. In accordance with the modular philosophy the impulse and Warp field generators are a single unit with a large radiator at the rear and two protruding field management coils. The antennas either side can generate a defence shield and serve as atmospheric stabilisers. The planetary observation dome is an older design and tied into a sensor band that runs around the perimeter. 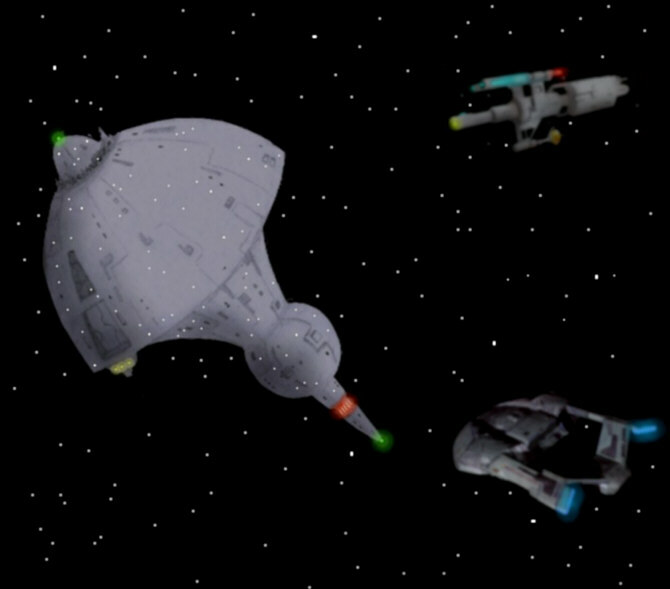 They are equipped with twin forward pulse phasers in addition to a full defensive phaser array around the hull and torpedoes can be mounted on an optional weapons pod. Ultimately the project was shelved pending further study as the vessels proved to be a little too wilful and frequently ignored commands in order to achieve their mission parameters and it proved almost impossible to control them once they had made a decision. Starfleet slowly began to adopt new design approaches in their vessels. The Apex class was a resounding success from an engineering standpoint but not suitable as an explorer due to her diminutive size. The first vessel to correct that failing was the Oeneris class vessel. Twenty three were eventually built and they admirably served for many years as science scouts and research vessels. It was a good deal less radical than the Apex and more flexible because of it. 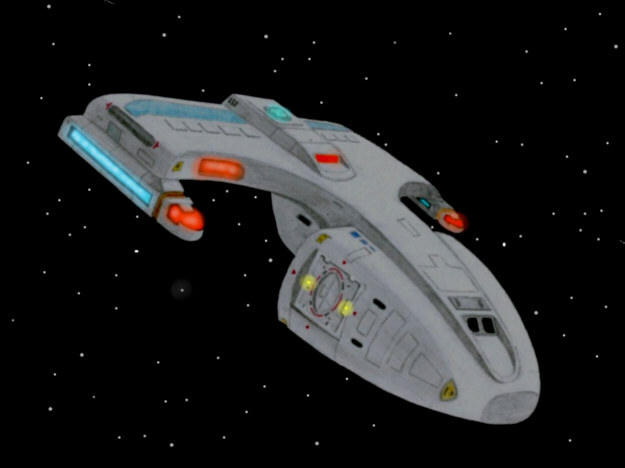 Her upper main hull was unique for a vessel of her size in having an arboretum and 6 holodecks thanks to the space saving design of her predecessor. Suddenly very small ships were able to offer much more comfort to the crew and greater usable internal space and thus their abilities were extended. Starfleet quickly began making variations of this vessel until Quantum-tunnel Transwarp became a reality and a proven technology. This leap limited the usefulness of vessels of this size. Now Starfleet could literally cross the galaxy and any ship doing so was likely to remain alone for some time and this slowly forced the size of vessels to grow once again. 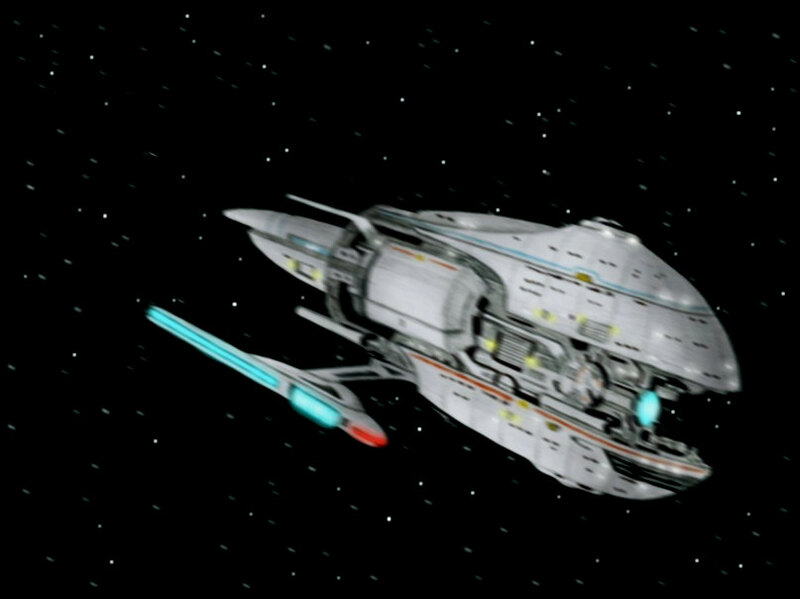 The Odyssey class was the first ship fully equipped with a workable Transwarp drive and had the size to operate quite happily on her own in deep unexplored space. 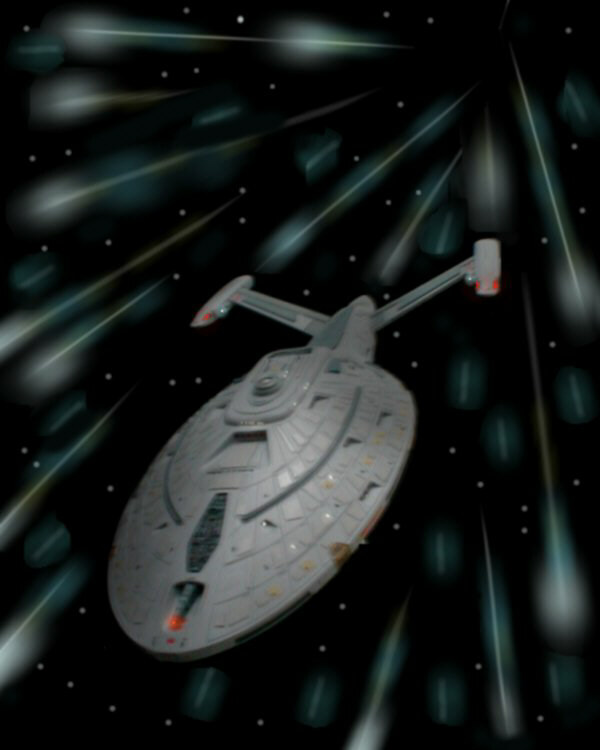 Warp drive was gradually phased out although ships retained the ability to use it for some time to come. Hyper impulse drive was fitted which allowed vessels to travel at the equivalent of Warp 5 but retain the manoeuvrability of simple Impulse. Even larger vessel were planned and the biggest ever built was the Goliath class although only two were ever actually in service. 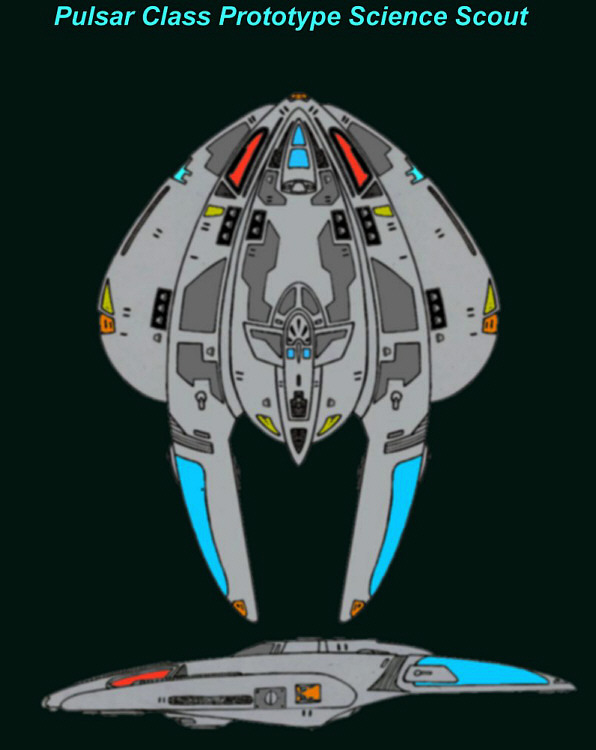 The Goliath was the first ship in Starfleet history not to be equipped with nacelles and was over 6 kilometres in length. This was a small kind of vehicle a little larger than a standard ship-board shuttle craft. It had an operating crew of two and no passenger bay. 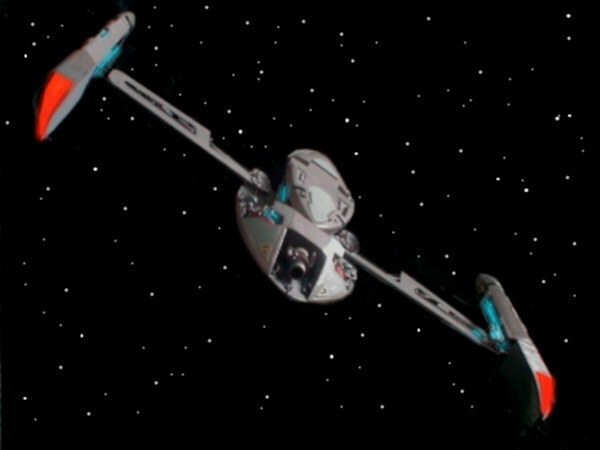 The additional space was taken up with an enlarged impulse engine and a battery module capable of running the ship at warp speeds for short periods. 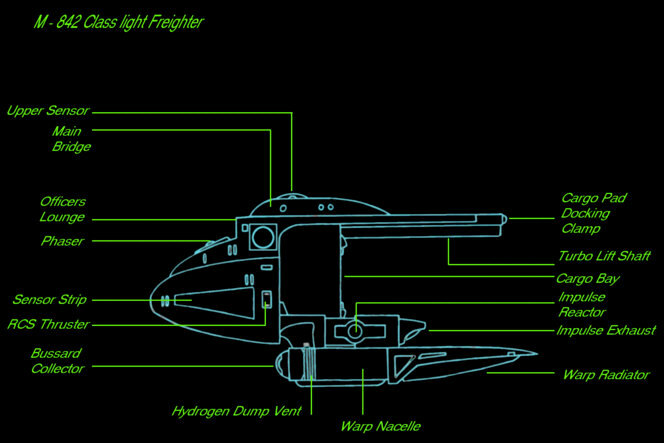 The aft weapons pod carried an enlarged phaser cannon which was almost as powerful as a starship bank of the same era. 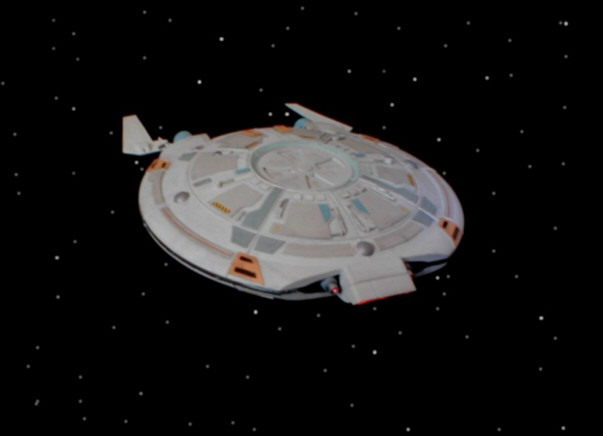 The ships were very cheap to build and run and could be quickly reloaded for missions on board a standard shuttle bay. These small ships were heavily armoured with a very strong forward shield arrangement as they were principally employed for fast attack runs relying heavily on the element of surprise. They were built in large numbers and were considered disposable. The crew compartment could be jettisoned through the floor panels in an emergency and all of the expensive computer components were stored in that unit for simple reuse. The M-842 is a fairly unremarkable freighter employed by the Federation. The design was fully classified by Starfleet engineers for deep space assignments. 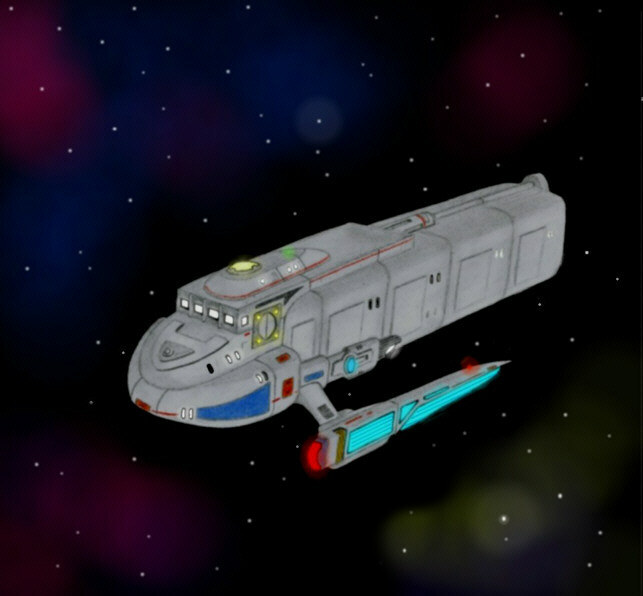 The ship is a modular cargo vessel with the forward section containing the entire engineering section, impulse and warp nacelles. The rear of the ship has a fixed cargo module that docks to floating cargo pods that interlock together to make the ship as long as the mission requires. They can operate with as many as 27 pods although the securing clamp and turbolift shaft has to be extended at a Starbase. The ship’s bridge is a small type with a large officer’s lounge beneath on deck 2 with an excellent forward view. There are unusually large airlocks to accommodate load palettes but a standard type is on the very rear access port to dock with shuttles or bases. 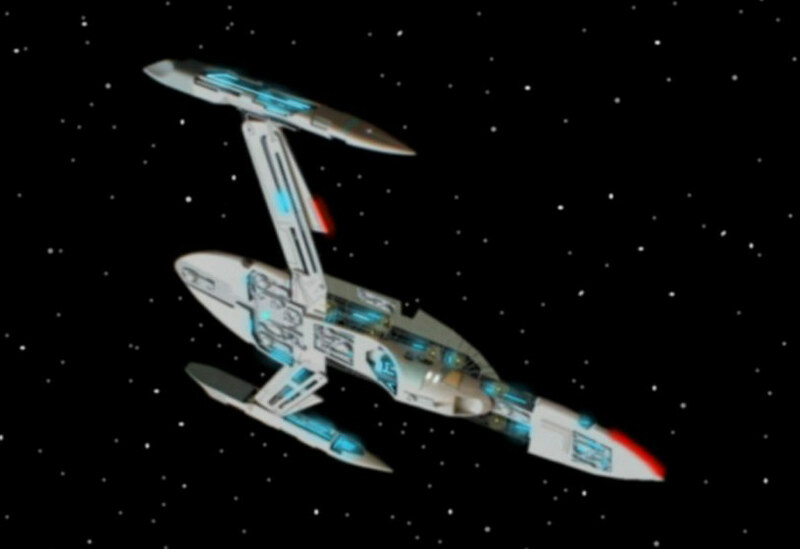 The impulse engines are an older proven type and while low on power compared to current Starfleet types they require very little maintenance as do the nacelles. A single forward and rear phaser pad is fitted and there are no provisions for launched weapons of any kind. The accommodation inside is suitable for a crew of 10, four officers and 6 enlisted crew but the ship is highly automated and can be operated for short periods by a single officer. The Nightingale class was introduced to serve as a medical transport ship. The main hull is a pressure sphere which is the most efficient design internally although not the best shape to maintain high warp speeds. Behind the main hull is two long booms that support the four nacelles and the impulse drive system is fitted externally. 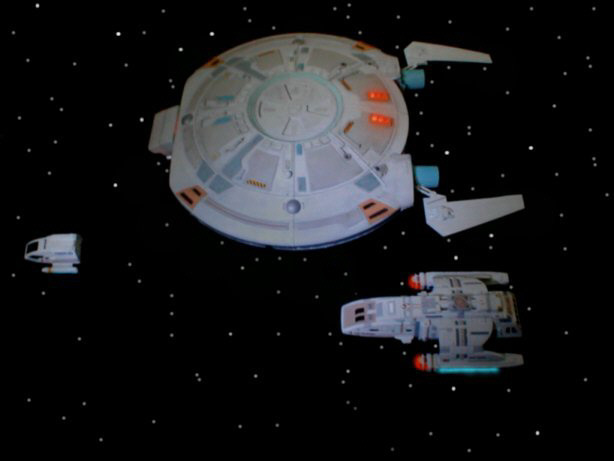 Each nacelle reacts with the one opposite but in event of a failure any two in line of sight can generate a stable field to keep the ship moving. The central pod between the drive arms is removable so that the hospital section of the ship can be dropped at a star base more quickly. The surgery bays are located in the sphere along with the engineering section and bridge. 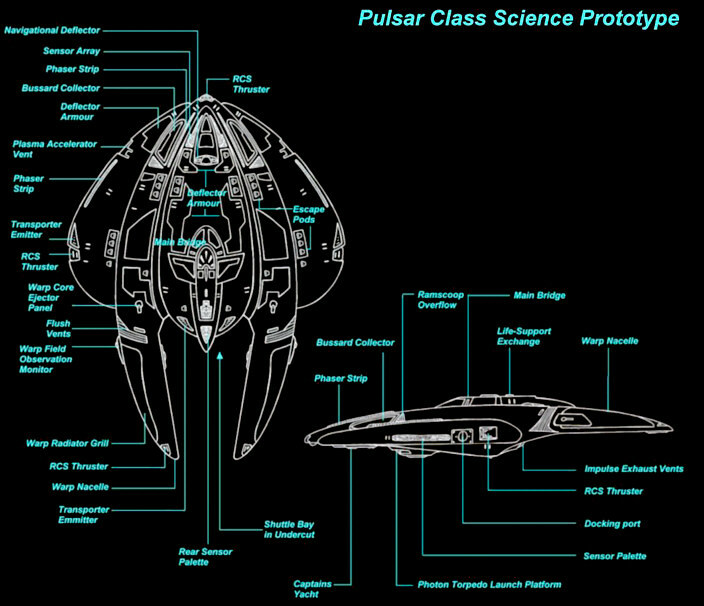 The Pulsar was an experimental Starfleet prototype for a science vessel to replace the ageing fleet of Oberth class ships. The Pulsar was eventually shelved in favour of the Nova class although in all trials it performed somewhat better. The heart-shaped hull had two booms that contained the warp field coils and two separate warp-cores fed from a central anti-matter generator plant. The idea behind this was double redundancy for long periods of warp travel. 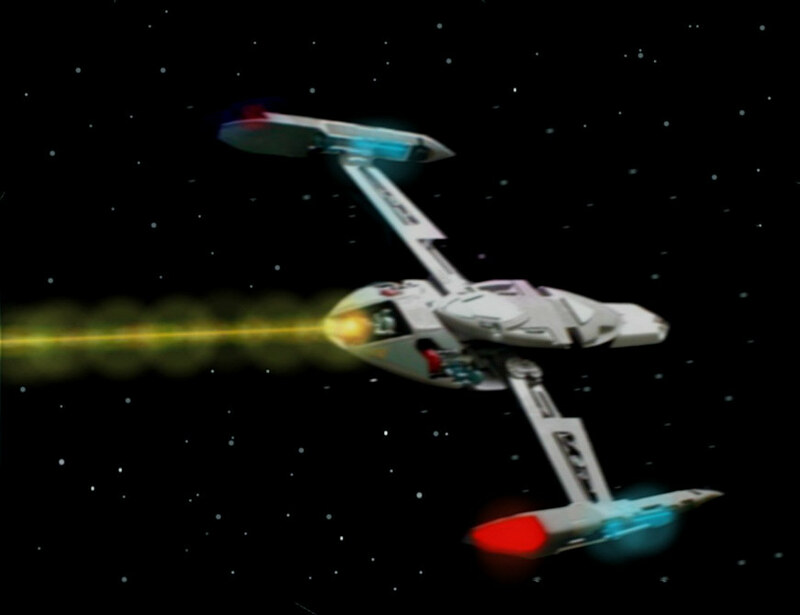 It takes a great deal more power to achieve warp speed than it does to maintain it so it would be possible to deactivate a core and feed both nacelles from the active one for brief periods to service the core and extend the longevity of the system. The ship was quite compact with only four habitable decks and a large shuttlebay beneath the bridge so internal space was at a premium. 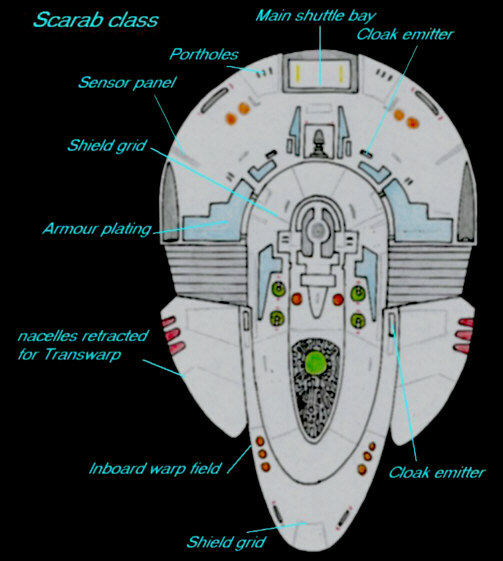 Much of the design was borrowed from the more militaristic front-line vessels with large deflector armour plating and a compact forward deflector dish in the nose and a full phaser array with a single forwards and rear torpedo tube. Starfleet intelligence is notoriously tough on Starships, especially on scout class vessels whose primary role is to investigate potentially hostile environments. Oberth and the newer Nova class are not suitable for missions where the ship will be engaged in scientific research but the possibility exists that the vessel may either come under fire or meet some natural phenomenon that could seriously threaten the ship. Heavily armed versions of the Oberth without the lower pod were tested but proved still to be lacking during the Dominion war where they were employed to plot the battle field for long range targeting. The solution to this problem was a refit program for the new Defiant class. Several space frames were modified to accept new equipment including downgraded and therefore more controllable engines and power supplies and improved sensors along with an upgraded computer core. 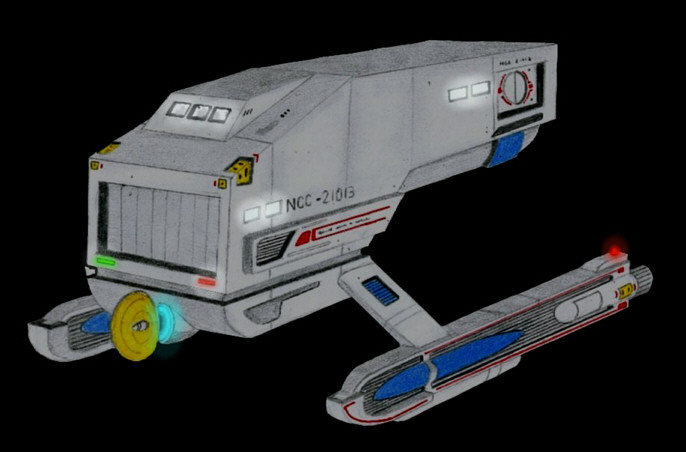 The shuttlepods were scrapped from the design and the ship was rearranged to have a single bay for a type 8 shuttlecraft from a housing at the front behind a actuated panel. 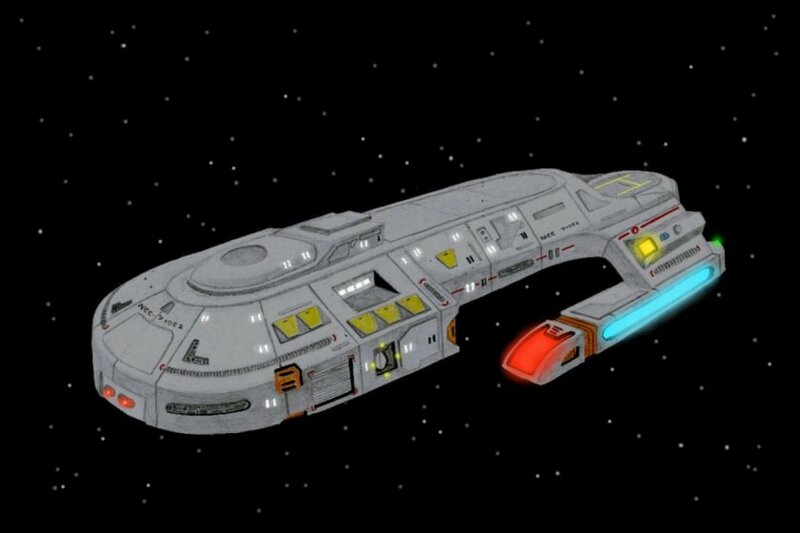 The Navigational Deflector housing was permanently fitted to the ventral hull and an all new science deck was added. The rear had a new indented section where a more traditional Impulse generator was fitted with a more flexible output. The entire vessel retained the tough armoured exterior of her ancestor vessels and they have proved a valuable and tough ship in a wide variety of hazardous environments. No stealth equipment was installed and they are only fitted with two pulse phasers instead of four and a grid of standard phaser strips. At this point five exist, three are under permanent attachment to Starfleet Intelligence and the other two are at the disposal of the scientific research programs of the Federation. 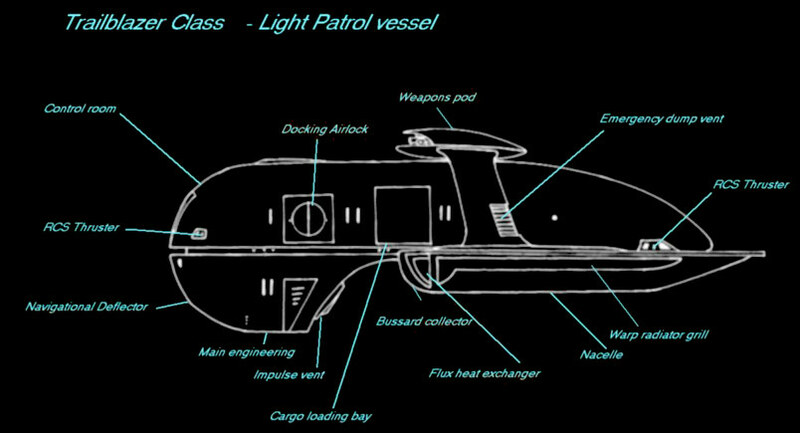 The Scarab Class was a special development project created by Section 31 utilising captured technology from the Borg, Romulan and other non-Federation species. 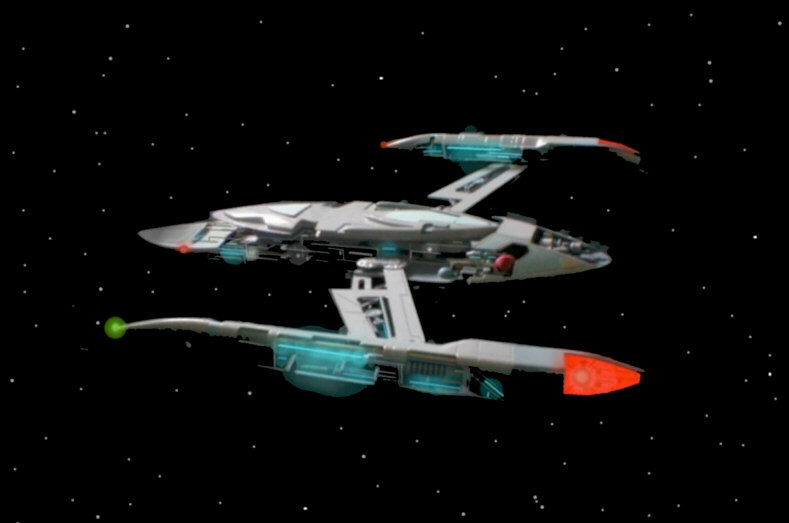 The ships have retractable wings for travelling at Transwarp although they are only capable of travelling beyond warp speeds for a few seconds. The computer system is highly advanced using crystal storage mediums and a processor that uses biological matter. They are capable of transporting matter through raised shields and have high speed replicators that can generate torpedos as they launch. They are heavily armed and capable of posing a threat to much larger ships. The project was discovered and halted and at which time only three were known to exist. 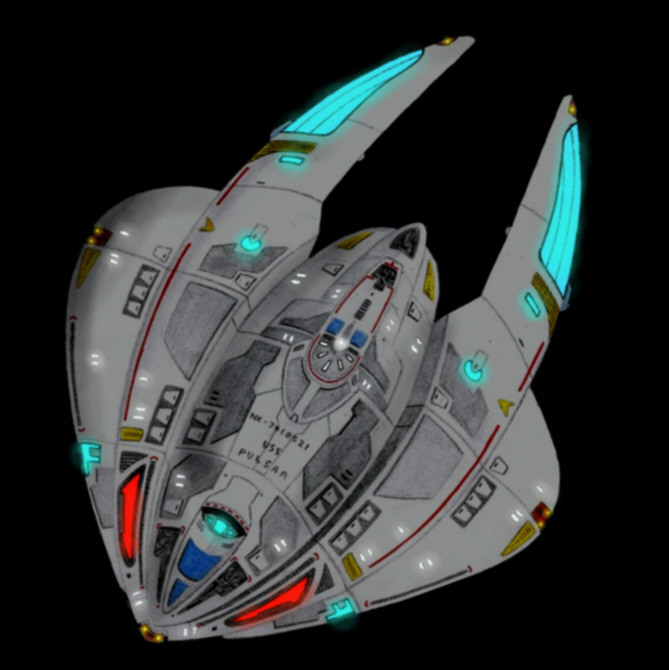 The Solaris light cruiser is a modern vessel built to serve in a wide variety of missions where a larger vessel may be unavailable or undesirable. The ship is operated by a minimal crew and the internal space is taken up with systems much larger than would normally be found on a ship of this size. The medical bay is big enough to deal with a rescue mission and backs onto the shuttle storage bay that can be instantly vented in an emergency to extend the triage capacity by five times. The forward nose of the main hull has a mission specific bay that can accept a variety of pods from increased weapons to deep space scanning equipment to further specialise the ship for any given role. The crew quarters are modular and the dividing walls can be moved to increase or decrease the size of the rooms or even collapse them entirely to accommodate an evacuation. The forward cargo bay has access directly through the hull and can house objects as large as two runabouts while the rear shuttle bay has a compliment of three type 6 shuttle, storing one in an under-slung bay with workshop and refuelling abilities. 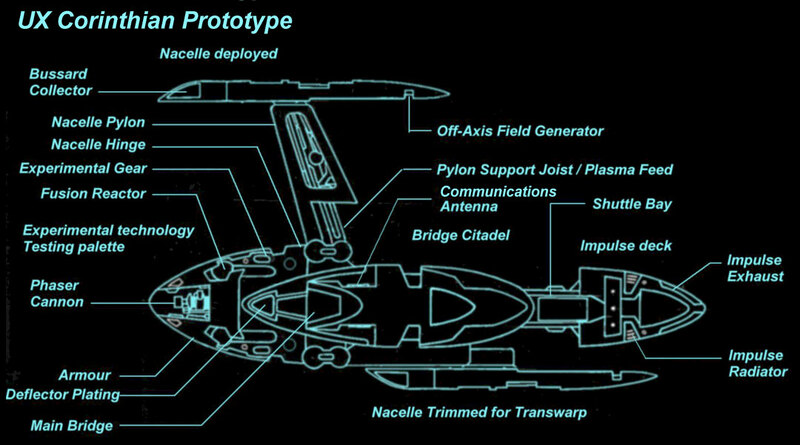 The twin impulse engines are built into the nacelle pylons to maximise space within the ship and the main plasma feed tubes to the warp drives are also external for the same reason. 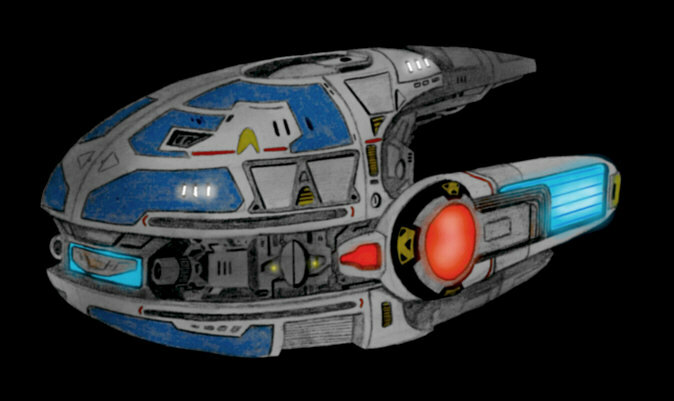 The navigational deflector is a small wide angle unit that fits under the forward hull and the ship is equipped with two forward and a rear photon torpedo tube as well as a full tactical array of type 9 phaser banks. The Starlight class is a generic name for small transport vessel mostly used for moving freight. The B12 model is a light tow with some internal capacity for limited loads of non-hazardous materials. The forward section has two standard docking airlocks and a small cockpit with crew accommodation for three people while the loading section behind is open planned for cargo. The “wings” house the fuel tanks and feed the two warp nacelles with the power generation unit housed in the centre which also serves as the impulse housing. The ship can tow standard cargo pods at up to a cruising speed of warp 6 but capable of warp 8 for short periods without an external load. 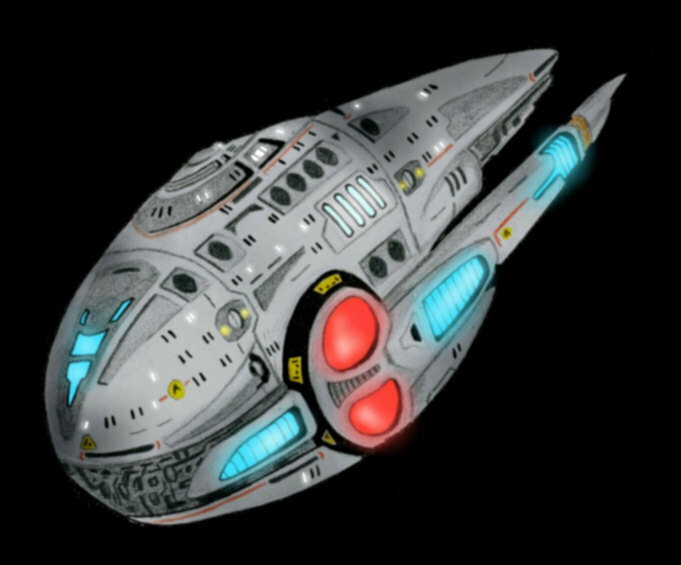 Starfleet uses these ships as courier vessels due to their relatively high speed and comfortable interior although they were primarily designed for civil use. 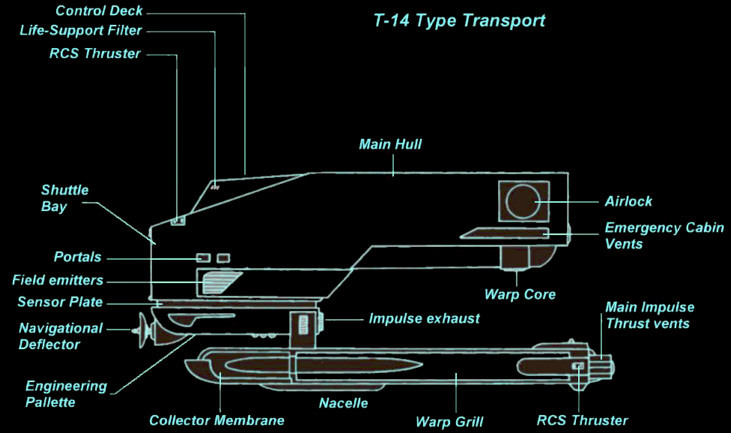 The T-14 was a low level courier vessel employed exclusively by Starfleet. 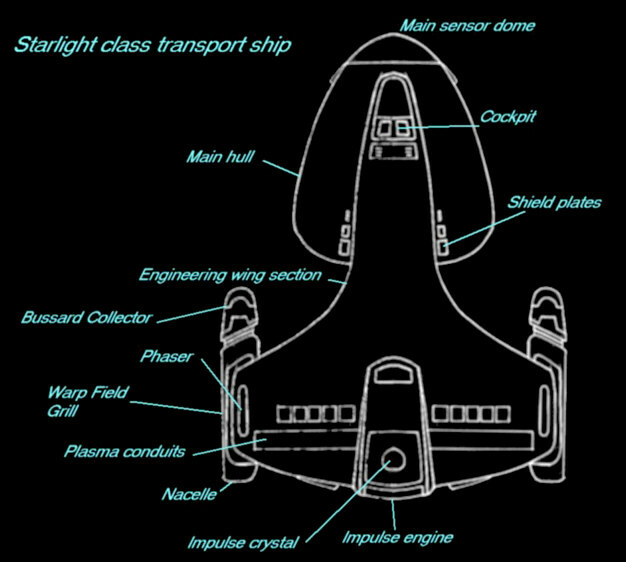 When most people think of elegant Starship design two vessels come to mind, the Constitution class and the T-14 at the opposite end of the spectrum which was widely considered to be the most aesthetically disastrous design ever made although the design grew simply from the requirements of the engineering. The vessel had an unusually large cargo area for such a relatively small vessel and was capable of loading a standard shuttle which was common practice when the ship served as a message courier. When the class was introduced it was the smallest ship in service capable of Warp 5 until the Vulcans introduced the Surak class shuttle. The command deck was mounted on the top of the craft above the cargo bay to assist in the loading of small auxiliary vessels and at the rear the craft has two standard docking rings. The ship was not considered a success, it’s main failings being that it was incapable of entering an atmosphere of an M-Class planet and that it expended fuel so quickly while at warp that it was more economical to run a full sized starship. The Trailblazer is a light vessel that is usually operated by a very small crew and frequently by none at all. They are fitted with an advanced computer system that utilises artificial intelligence software to allow the ships to operate as unmanned scouts in highly hazardous environments. They were introduced initially to serve as border patrol and defence ships and have a fairly large internal capacity with a small holodeck to allow a crew some relief from the boredom of routine patrols and a large cargo deck. They are 48 metres long and are fitted with an unusually large deflector for their type as they can run at warp 9 for short periods of time. The Violator is a variant of the Intrepid class. 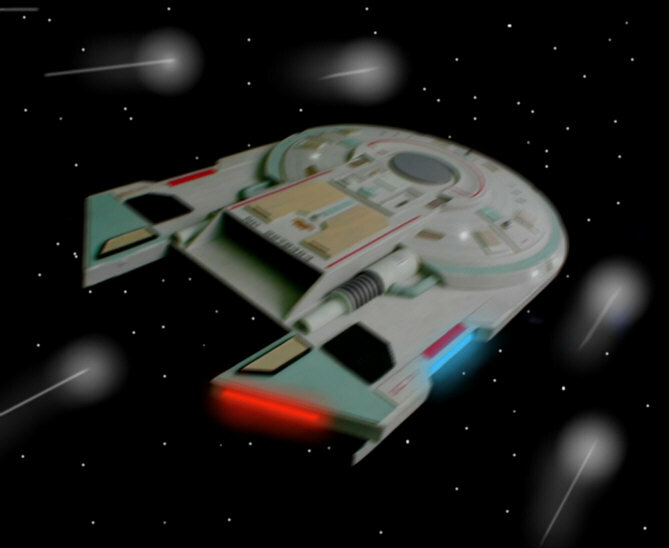 Starfleet intelligence specially outfitted 5 of these ships to "Violator" standard. They were conceived as mini-Sovereigns with upgraded systems and weapons but maintaining the manoeuvrability of the smaller ship. 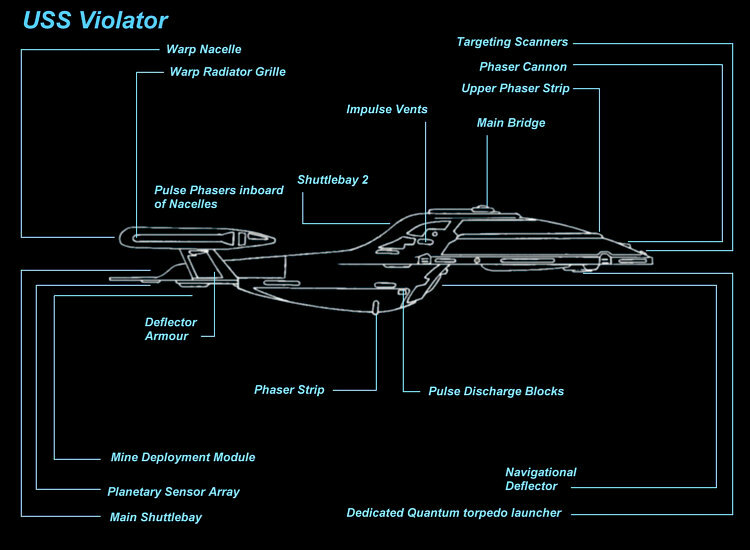 Upgrades include a dedicated quantum torpedo launcher under the primary hull, a second larger shuttlebay beneath the bridge, more powerful impulse engines, pulse phasers, ablative armour and a phaser cannon in the indent where the secondary deflector usually is. 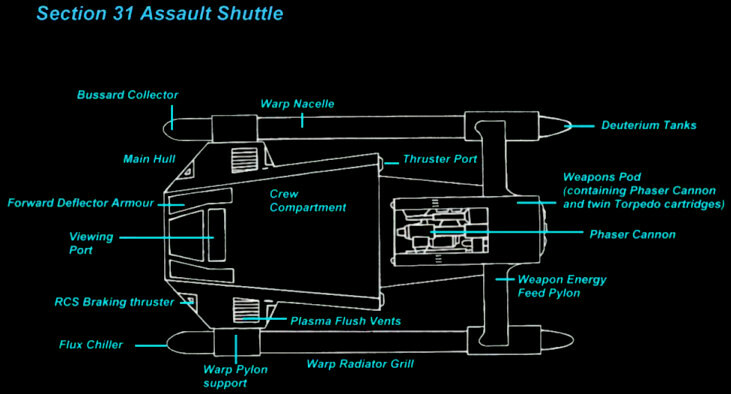 The larger pylons house additional fuel tanks and allow space for extra outer shield generator panels. The vessels are also fitted with several classified systems. 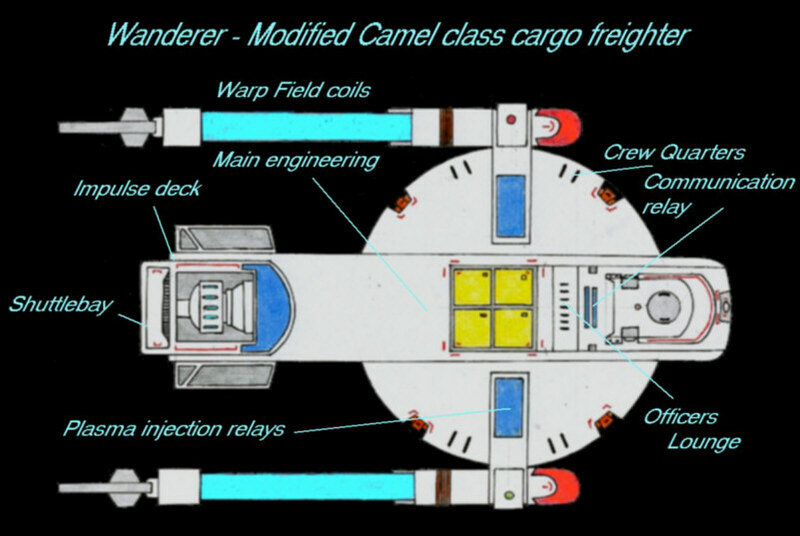 The Wanderer started out life as a Camel class transport ship before an accident in which she was rammed by an errant personal racer. Both were sold for scrap and salvaged together. 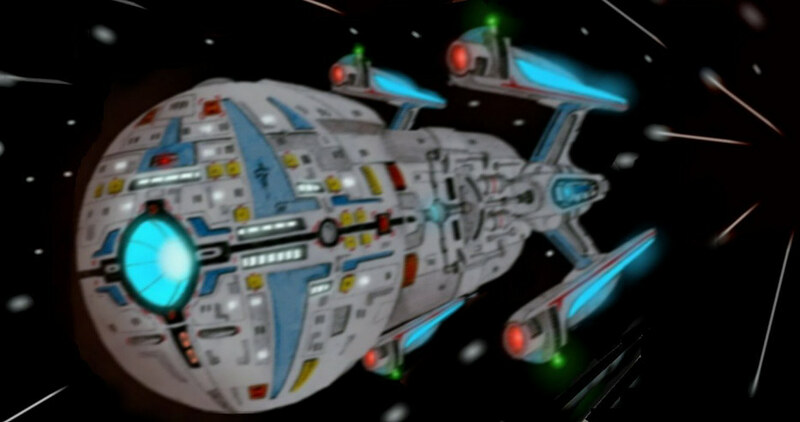 The nacelles are highly powerful E-34 models but the generator systems could never feed them with enough energy so the gains in speed were only quite slight giving her a top speed of Warp 6. 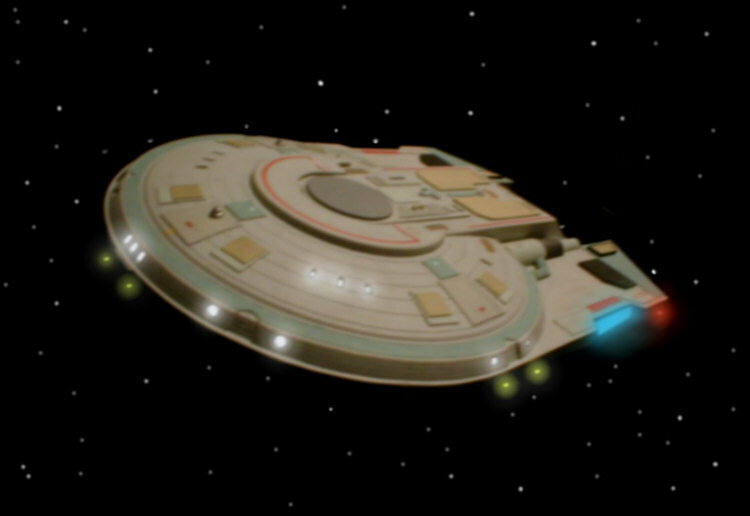 She was equipped with a single phaser pad on the top of her deflector housing. The Trinok 2 colony is one of the principal civil Starship construction facilities within Federation borders. The vessels built there already have a good reputation for safety and reliability but still they occasionally produce a ship that serves no other purpose than to be a superior vessel that gains interest and a sense of pride for their construction yards. The Pinnacle-class starship is the latest in a long line of such vessels built to flatter their range of products. It is not a commercial vessel in the true sense in that it serves no role normally associated with a private, civil or merchant mission. In essence it is more like a Starfleet ship of exploration with general equipment throughout of a very high standard. 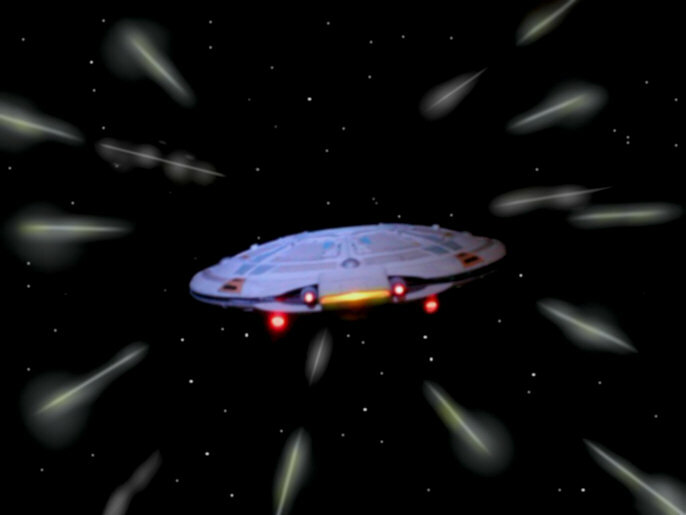 With the exception of the tactical grid the Pinnacle is a match to most small Starfleet ships. The shuttle bay is large enough to accommodate Runabout sized vessels and the Warp-core is the same type used aboard the later production Oberth- and Nova-class ships. The Wanderer 2 was built with special upgrades including more powerful phaser banks that can match an Excelsior class and a special gravity field that surrounds the arms of the captains chair and makes spilling drinks a physical impossibility. 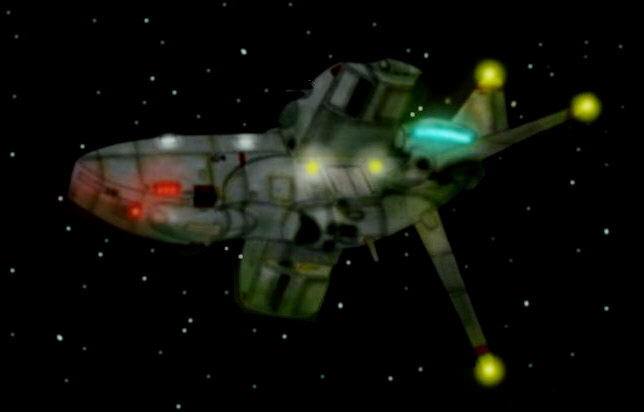 The Type 3 Starbase is a relatively small base deployed in non-tactical positions throughout Federation space, however they are armed with a phaser grid and two photon torpedo launchers in the tip and base as well as defensive shields. They are typically equipped with 20 Type 6 shuttles and usually have a small starship permanently assigned to them for emergencies and possible evacuation. The main doors are large enough to accommodate a scout vessel and have exterior docking rigs for larger vessels. The H60 is among the largest vessels in private service throughout the Federation. It can be equipped with a series of modular cargo tanks that fit around the central spine module and can take a maximum of 12 with an additional pair mounted on the forward hull. The ship relies heavily on a modular design with the forward hull containing the crew quarters, engineering and shuttle compliment as well as sizeable internal capacity for freight. The removable central spine has its own fusion reactors to power the life support systems and shields as each of the mounted cargo canisters is independently surrounded by a force field to protect the rest of the vessel if a dangerous cargo was loaded. Each of the modules is fitted with a standard Starfleet type airlock and is outfitted with artificial gravity. The modules have a rudimentary thruster system that is not widely used; most often a tug will dock with the airlock and tow in the cargo manually. The H60 class has an excellent record for safety but is lightly armed and equipped with minimal shielding by Starfleet standards. They are a costly vessel to maintain and are usually only found operating in well established shipping lanes and frequently escorted by several small Starfleet vessels if any risk of attack is likely. The V-12 is a fairly primitive Federation-type cargo vessel that served some years ago as a light Starfleet utility ship in limited numbers but the design was not considered an overall success. The main hull is roughly about the size of a Danube- class Runabout with twin outriggers that stow a removable cargo pod on either side of the hull. The impulse engines are mounted on the far outside of the pod connection arms but retract when the ship isn’t towing the trailers. 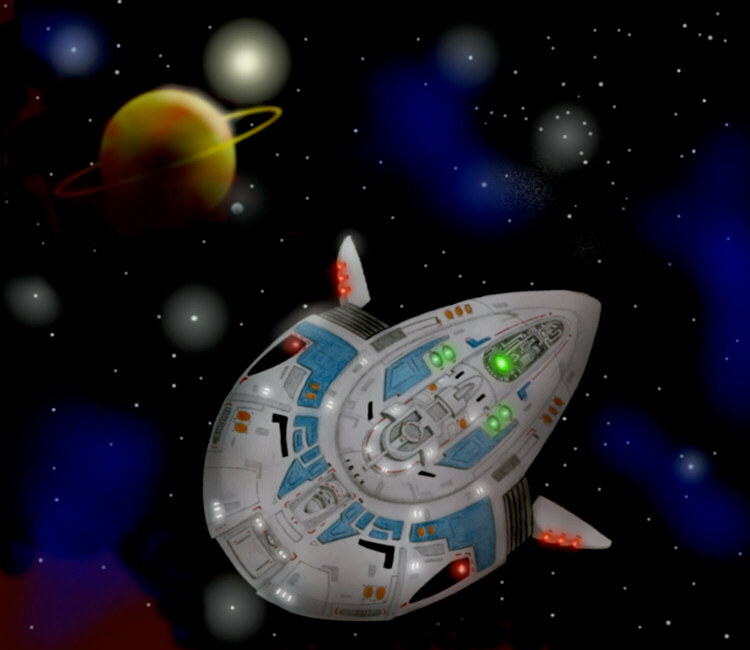 The whole ship is reasonably aerodynamic for planetary entry. It has four large “wings” at the rear which assist with control of the vessel in a heavy atmosphere but are additionally large sub-space antennae and assist in controlling the warp field since they were one of the few designs without the common twin-nacelle configuration. They had two small warp field generator pods in the tail but the ship was of an unusually general design with the Bussard collectors in the nose and the warp coils laid out in the cargo arms. The outside trailers were a standard unit but another cylindrical version was built for frequent atmospheric use where it was unsafe or unreliable to rely on the Impulse field. As was common practice at the time the airlock at the rear is a self-contained survival module designed to be able to eject and serve as an escape pod in the event of the loss of the ship. 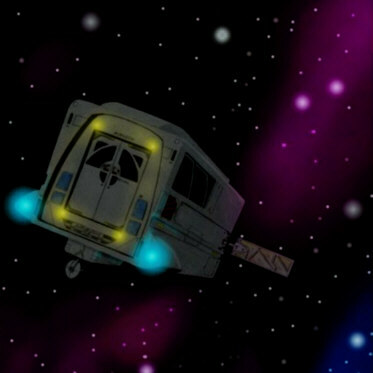 On many Federation bases the modules can be seen serving as short-range passenger transports as they proved to be incredibly reliable and durable. These vessels were a common sight in service around larger Starbases and within planetary systems but are rarely seen in deep space due to their small size and lack of interior comforts. They were decommissioned from Starfleet use many years ago to replaced with more modern Runabout designs but many of the vessels ended up in private hands where a few were modified into private yachts with the cargo modules converted into more suitable accommodation.